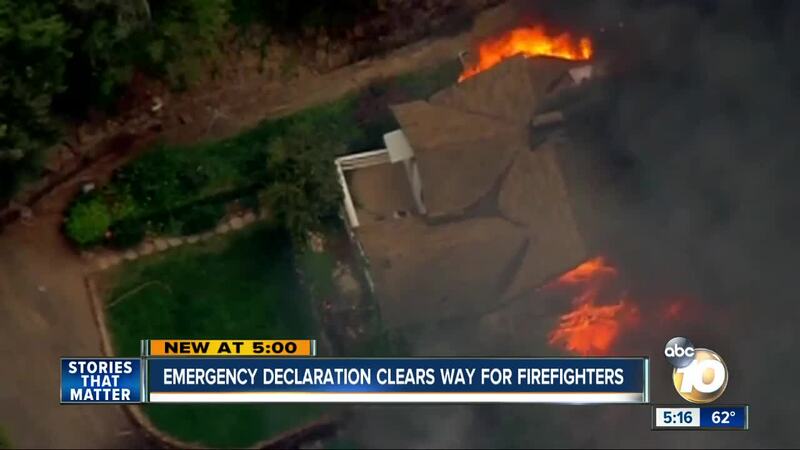 SAN DIEGO (KGTV) - California Governor Gavin Newsom signed a State of Emergency Proclamation Friday clearing the way for firefighters to jump on projects meant to protect communities. Newsom said we're seeing larger and more dangerous wildfires than ever before and as a state we need to change our approach. "Our world is changing, the wets are getting a lot wetter, the hots hotter and the dry, drier," he said. Alpine shared in the devastation last year; the West Fire leveled neighborhoods and left dozens homeless. CalFire Director Michael Mohler said ten crews across the state will be activated under the proclamation to clear brush and conduct controlled burns. They will also work with 110 members of the National Guard. The proclamation focuses on vulnerable communities. CalFire's Priority Fuel Reduction Project List i ncludes two communities in San Diego County, Guatay and Crest. "Some of them have gone through some kind of environmental review," Director of the Sierra Club, Katheryn Phillips said. The U.S. Forest Service plans prescribed burns a year in advance to account for the environmental processes. "We already know the areas of concern and we know how the fire is going to react to those areas, so we have a lot of biologists come in, a lot of fire experts come in and determine which areas are good for burning," Public Affairs Officer for Cleveland National Forest Olivia Walker said. Under the proclamation, environmental regulations are suspended, concerning environmentalists. "If it's a butterfly mating season and it's an endangered species, it's not going to be the proper time to burn," Walker said. "Could an unintended consequence be a mudslide?" Phillips added. Mohler said there's nothing to worry about, saying the proclamation solely streamlines the paperwork. He said they will absolutely bring in biologists, environmental scientists and archeologists before lighting prescribed burns. "The good news is the governor is engaged in this issue I think the issue of how we deal with some of the impacts of climate change; this is just the beginning of a very long conversation," Phillips said.